This review of the 2015-16 Major Projects Report also includes analysis of ANAO Audit Report No. 11 (2016-17), Tiger – Army’s Armed Reconnaissance Helicopter. As part of its review, the JCPAA held one public hearing in Canberra on 31 March 2017 with representatives from the ANAO and Defence. A list of witnesses is at Appendix C. A list of submissions to the inquiry is provided at Appendix B. The objective of the MPR is to ‘improve the accountability and transparency of Defence acquisitions for the benefit of Parliament and other stakeholders’.12 At the public hearing, the ANAO noted that developing a document like the MPR was ‘something that you work at and puzzle at over time’, that ‘a sensible conversation and debate will often help progress it, perhaps by incremental steps’, and ‘there is a value in the dialogue.’13 The Auditor-General noted the underlying information that led Defence to one conclusion and the ANAO to another (the qualified audit finding) was available to all, and that the debate was more about the conclusion drawn from that information, than the information itself. Another key principle underpinning the Committee’s review of the MPR was retaining transparency over projects not yet complete that had been given FOC status by service chiefs. In the case of the Tiger, FOC was declared by the Chief of Army in April 2016. However, the MPR notes the Tiger Project is not yet complete, as FOC was declared with nine15 caveats outstanding. At the public hearing Defence stated: ‘broadly, those caveats have now been resolved, and most of them did not apply specifically to the project aspects; they were broader, fundamental inputs to capability that needed to be managed’.16 (Individual issues relating to the Tiger are considered below). (e) the Capability Manager’s assessment, including overall risk rating and the extent to which this risk rating relates to the Capability Acquisition and Sustainment Group (CASG’s) responsibilities. 1.10 All projects selected for removal from the MPR will be proposed by Defence based on the above criteria, and provided to the JCPAA for endorsement, by the ANAO by 31 August in the year to which the MPR relates. The Committee expects Defence to provide this information as soon as possible. As highlighted in the March 2014 hearing, there is no system that universally tracks the inputs to capability by [Defence] and hence no easily auditable representation of information. However, [Defence] has suggested including the key deliverables which constitute Initial Materiel Release and Final Materiel Release as stipulated in the Materiel Acquisition Agreements for each project, which we consider is appropriate at this time, noting that there can be sensitivities in regard to disclosing information about elements of capability. Notwithstanding the lack of progress by Defence in improving capability performance analysis and reporting, the ANAO has added a new level of analysis that may provide perspective to assist the Parliament in understanding capability performance. 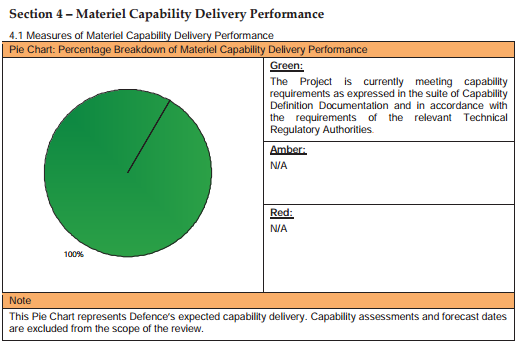 The 2015-16 MPR provides two worked examples, as discussed below, of projects that Defence reports as achieving 100 per cent capability despite being at vastly different stages of development. Figure 3.1 below is the current level of Defence analysis for the AWD Ships project. Source: 2015-16 Major Projects Report, p. 165. Table 3.1 constitutes ANAO analysis of the same project, using a different methodology. Figure 3.2 below is the current level of Defence analysis for the Bushmaster Vehicles project. Source: 2015-16 Major Projects Report, p. 295. Table 3.2 constitutes ANAO analysis of the same project, using a different methodology. Commencement of delivery of full rate production for Production Period 1 (PP1) vehicles. Source: 2015-16 Major Projects Report, p. 15. The scores report current project status against a benchmark, assigning a score from 1-10, which ranges from the beginning of a project to completion. We are reforming the whole system that we operate under, so the things I mentioned before – capability life cycle, new approach to engagement with industry, new approach to smart buyer components, establishing centres of expertise across the organisation. As at April 2016 the Tiger had 76 capability deficiencies, 60 of which were deemed by Defence to be critical. Other limitations relate to shipborne operations, interoperability and communications, airworthiness, and the roof mounted sight. Sustainment costs have exceeded the original contract value. The cost per flying hour in June 2016 was $30,335 compared to a target of $20,000. The funding streams to support Tiger into the future are through the Army sustainment budget and also through the Army Capability Assurance Program [CAP]. Specifically that really focuses on investing to solve any obsolescence issues that will affect Tiger in future years. ANAO Report No. 40 (2016-17) 2015-16 Major Projects Report (hereafter 2015-16 Major Projects Report), p. 129. ANAO, 2015-16 Major Projects Report, p. 130. ANAO, 2015-16 Major Projects Report, p. 8. Mr Michael White, Executive Director, Performance Audit Group, ANAO, Committee Hansard, Canberra, 31 March 2017 p. 2. Mr Grant Hehir, Auditor-General, ANAO, Committee Hansard, Canberra, 31 March 2017 p. 2. Mr Kim Gillis, Deputy Secretary, Capability Acquisition and Sustainment Group (CASG), Department of Defence, Committee Hansard, 31 March 2017, p. 15. Mr Grant Hehir, ANAO, Committee Hansard, Canberra, 31 March 2017, p. 15. Major General Andrew Mathewson, Head, Helicopter Systems Division, Army, Department of Defence, Committee Hansard, Canberra, 31 March 2017, p. 15. Mr Michael White, ANAO, Committee Hansard, Canberra, 31 March 2017, p. 2. Joint Committee of Public Accounts and Audit, Report 458 - Defence Major Projects Report (2014-15), p. vii. Dr Tom Ioannou, Group Executive Director, Performance Audit Group, ANAO, Committee Hansard, Canberra, 31 March 2017, p. 14. Mr Kim Gillis, CASG, Committee Hansard, Canberra, 31 March 2017, p. 14. Major General Andrew Mathewson, Defence, Committee Hansard, Canberra, 31 March 2017, p. 2. Major General Andrew Mathewson, Defence, Committee Hansard, Canberra, 31 March 2017, p. 3. Department of Defence, Submission No. 2.1, p. 1. ANAO, 2015-16 Major Projects Report, pp. 460-1. Major General Andrew Mathewson, Defence, Committee Hansard, Canberra, 31 March 2017, p. 5. Mr Grant Hehir, ANAO, Committee Hansard, Canberra, 31 March 2017, p. 7. The review was commissioned in August 2014 to ensure that Defence is fit for purpose and is able to deliver against its strategy with the minimum resources necessary. JCPAA, Report 458 - Defence Major Projects Report (2014-15), p. 48. Recommendation 2.11: significant investment to develop an operational framework which comprehensively explains how the organisation operates and the roles and responsibilities within it; detailing the life cycle management processes which provide project and engineering discipline to manage complex materiel procurement from initiation to disposal; and reviewing architecture to reinforce accountability at all levels and bringing together information upon which good management decisions can be made. Department of Defence, First Principles Review – Creating One Defence, 1 April 2015, p. 9. Department of Defence, Executive Minute No. 1 on JCPAA Report 458, p. 1. Mr Gregory Divall, Group Business Manager, Capability Acquisition and Sustainment Group (CASG), Department of Defence, Committee Hansard, Canberra, 31 March 2017, p. 8. Joint Committee of Public Accounts and Audit, Report 458 - Defence Major Projects Report (2014-15), pp. 30-31. Joint Committee of Public Accounts and Audit, Report 442 - Defence Major Projects Report (2012-13), pp. 38-39. Department of Defence, Submission No. 2.1, p. 5. Department of Defence and Australian National Audit Office, Response to JCPAA Report 442, p. 3. ANAO, 2015-16 Major Projects Report, p. 54. Mr Grant Hehir, Auditor-General, ANAO, Committee Hansard, Canberra, 31 March 2017, p. 2. ANAO, 2015-16 Major Projects Report, p. 15. For example, ANAO, 2015-16 Major Projects Report, p. 165. Mr Michael White, ANAO, Committee Hansard, Canberra, 31 March 2017, p. 13. 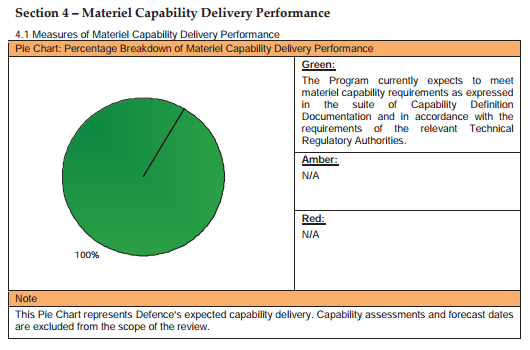 Department of Defence, DMM (PROJ) 1-0-001, DMO Project Management Manual 2012, April 2012, p. 75. Dr Tom Ioannou, ANAO, Committee Hansard, Canberra, 31 March 2017, p. 11. ANAO, 2015-16 Major Projects Report, p. 26. Joint Committee of Public Accounts and Audit, Report 458 - Defence Major Projects Report (2014-15), p. 63. Joint Committee of Public Accounts and Audit, Report 458 - Defence Major Projects Report (2014-15), p. 50. Department of Defence, Executive Minute No. 2 on JCPAA Report 458, p. 1. ANAO, 2015-16 Major Projects Report, p. 56. Mr William Divall, Defence, Committee Hansard, Canberra, 31 March 2017 p. 11. Mr Kim Gillis, CASG, Committee Hansard, Canberra, 31 March 2017, p. 11. Mr William Divall, Defence, Committee Hansard, Canberra, 31 March 2017, p. 12. Mr Kim Gillis, CASG, Committee Hansard, Canberra, 31 March 2017, p. 15. Mr Grant Hehir, ANAO, Committee Hansard, Canberra, 31 March 2017, p. 16. Department of Defence Submission No. 2.1, p. 6. ANAO, 2015-16 Major Projects Report, p. 10. ANAO, 2015-16 Major Projects Report, p. 12. ANAO, 2015-16 Major Projects Report, p. 13. ANAO, 2015-16 Major Projects Report, p. 41. Major General Andrew Mathewson, Defence, Committee Hansard, Canberra, 31 March 2017, p. 9. Mr Kim Gillis, CASG, Committee Hansard, Canberra, 31 March 2017, p. 8. Mr Kim Gillis, CASG, Committee Hansard, Canberra, 31 March 2017, p. 9. For more information, see Department of Defence Submission No. 2.1, pp. 3-4. Department of Defence, Submission No. 2.2, p. 1. Department of Defence, DMM (PROJ) 11-0-002, DMO Project Risk Management Plan 2013, July 2013, p. 108. Collins R&S Project does not have a formal contingency allocation. ANAO, 2015-16 Major Projects Report, p. 24. ANAO, 2015-16 Major Projects Report, p. 25. Mr Kim Gillis, CASG, Committee Hansard, Canberra, 31 March 2017, p. 12. Mr Kim Gillis, CASG, Committee Hansard, Canberra, 31 March 2017, p. 13. ANAO, 2015-16 Major Projects Report, p. 27.
, ANAO Audit Report No. 11 (2016-17) Tiger – Army’s Armed Reconnaissance Helicopter, p. 8. ANAO, 2015-16 Major Projects Report, p. 80. ANAO, 2015-16 Major Projects Report, p. 94. ANAO, 2015-16 Major Projects Report, p. 252. Major General Andrew Mathewson, Defence, Committee Hansard, Canberra, 31 March 2017, p. 4. Mr Kim Gillis, CASG, Committee Hansard, Canberra, 31 March 2017, p. 6. Air Vice Marshal Mel Hupfeld, Head, Force Design, Department of Defence, Committee Hansard, Canberra, 31 March 2017 p. 6. ANAO, 2015-16 Major Projects Report, p. 260. ANAO, 2015-16 Major Projects Report, p. 251. Department of Defence, Submission No. 2.3, p. 1. ANAO, 2015-16 Major Projects Report, p. 420. Department of Defence, Submission No. 2.2, p. 3. ANAO, 2015-16 Major Projects Report, p. 448. Mr Peter Croser, Director General, Specialist Ships Acquisition, CASG, Committee Hansard, Canberra, 17 March 2016, p. 5. ANAO, 2015-16 Major Projects Report, p. 53. ANAO, 2015-16 Major Projects Report, p. 451.